Laptop PCs / Computers - PC Buyer Beware! If you read through this entire article, you will have all of the information you need to make a sensible decision involving the purchase of a laptop computer and you will know how it can be looked after, serviced, repaired and upgraded. Moreover, the intention of the Laptop Problems posts of this website is to address a wide range of laptop PC problems. Visit the Tablet PCs/Tablets page on this website for information on them. – Does a home insurance policy cover a laptop? Laptop PCs/computers are also called notebooks. There are two main species of laptop/notebook computers – the PC laptop that runs a version of Windows (the latest officially released versions of which, since 28 July 2015, are Windows 10 Home and Pro for the home user) that run software designed for Windows – and the Apple Mac that runs its own operating system called Mac OS X for the desktop and iOS for mobile devices – tablets and smartphones – which have software specially written for them. Windows 10 can be run on any computing device – desktop, laptop, tablet and smartphone. Apple calls OS X “the world’s most advanced operating system”. Microsoft supplied or supplies 32-bit and 64-bit versions of Windows 7/8.1/10. Most new computers come with a 64-bit version of Windows, which is better than having a 32-bit version as long as the computer has a minimum of 4GB of RAM memory and preferably at least 8GB, because a 64-bit operating system requires twice the amount of memory as a 32-bit version, which can only run a maximum of 3.2GB, so more than 4GB is a waste and may even slow the computer down. Most PC games are designed to run on Windows, but, if you don’t use your PC for that purpose, 64-bit versions of Apple’s OS X or a distribution of Linux, such as Ubuntu, is perfectly adequate. Laptops running Google’s Chrome operating system, called Chromebooks, are designed to access the web with very limited offline capability were available from June 2011, but you should read the reviews, especially purchaser reviews, before deciding to use Chrome instead of Windows 7/8.1/10. Laptops using a distribution of Linux, such as Ubuntu, are also available from manufacturers such as Dell. Most of the software – web browsers, office suites, utilities, etc. – that a distribution of Linux uses, such as Ubuntu, is free. The main detraction in using Google products and services is that they are all designed to provide Google with information about their users. The personal information is used to compile personal profiles that are used by Google to deliver ads across the web and elsewhere, such as on smartphones using Google’s Android operating system, which is a development of Linux. Standard laptops have a lid that houses the screen and a base that houses the keyboard and touchpad. 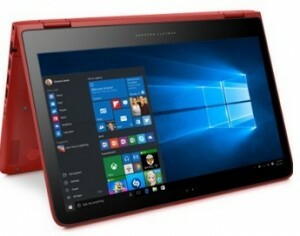 Windows 8.1/10 laptops have been available for a while that can be used as tablets, manufactured by Lenovo, Dell and HP, MSI, Asus, etc. For example, the HP Pavilion x360 range that have a touchscreen that has a keyboard base that can be flipped 360 degrees to form a base so that the touchscreen can be used instead of the keyboard. It’s always advisable to read the online reviews by both purchasers on sites, such as Amazon, which I find very helpful, or review websites before deciding on making a purchase. 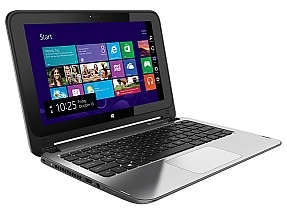 Below are two images of a HP Pavilion x360 laptop. The top image shows an example being used in tablet mode that uses the touchscreen, showing the Windows 10 Start Menu that combines the Windows 8 tiled Start screen and the Windows 7 Start menu. The bottom image shows the an example set up in laptop mode that uses the keyboard, showing the tiled Windows 8 Start screen. The Lenovo Yoga laptop range that converts into a tablet, comes in low-spec to high-spec models. The low-spec Yoga 300 model, shown below, was recommended as a cheap laptop for use by students by Expert Reviews. Here are the basic specifications of the Yoga from the 300 to the 900 models. Click on the image to view its full size. You should always read reviews and purchaser reviews before making a purchase to make sure that any laptop or tablet you buy is best suited to your computing needs. Many of Amazon’s purchasers go out of their way to create useful detailed reviews that are almost all reliable. People who go to the trouble to make detailed long reviews are usually honest. Dishonesty likes to keep things short on detail. As you can see in the image above, the Yoga 300 model has an embedded 32GB eMMC data-storage card, not an SSD drive. It is used to keep the price low. eMMC storage is really an embedded SD card. Both an embedded eMMC card and a SD card use flash memory that is much slower and of lower quality than the type of flash memory used in SSD storage drives. Bear in mind that the latest Apple iPhones use SSDs ranging in capacity from 32GB to 256GB. When I did the research in October 2016, the Yoga 300 model came with a choice of the processors shown in the image below. The higher the specification of the processor and other components, such as the storage drive or embedded card, the more expensive the model is. One review on Amazon by a purchaser said that he bought the model with Windows 8.1, which he could not upgrade to Windows 10 because the storage capacity of the embedded eMMC card was too low. Very useful information. 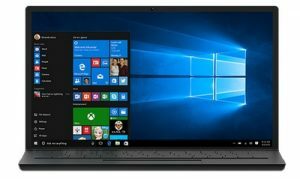 I would only buy a new laptop that runs the latest version of Windows [e.g., Windows 10], even if it comes with a free upgrade from the previous version [e.g., Windows 8.1]. An upgraded operating system is never as good as a clean installation, because it contains all of the many updates of the previous version plus its own updates. If you are only going to use the laptop for accessing the web, running office applications, watching movies, emailing and perhaps using the free Skype to video call (you can see the other person and he/she can see you in real-time if both computers are running Skype), the lower-priced models of a range would do just as well as the higher-priced models. Note that a laptop must have a built-in webcam in order to use Skype. Note that it is now possible to sign in to Skype, acquired by Microsoft, with a Facebook account. If you experience problems doing so, downloading the latest version of Skype should fix the problem. You need to make the correct choice, because if you buy a laptop, netbook or tablet computer that does not provide the features you need, you cannot return it just for that reason. You will only be able to return it if the computer that you received was not the make/model that you ordered, it was missing features or components that you ordered, or it was not working out of the box, or it stopped working at a later date and could not be repaired by the vendor or manufacturer. If it was not working out of the box, you are entitled to a replacement of the same model. In that event, if you discovered that you had made the wrong choice, you could negotiate with the vendor in order to be supplied with a more appropriate choice. You should always read the most recent purchaser reviews of a laptop/netbook/tablet PC before you buy it, because faults and limitations are usually reported. You have to read the purchaser reviews on a website that does not remove negative reports or comments, such as Amazon. If old reviews highlight a fault, it will probably have been fixed by the manufacturer, but that might not be the case, so do some more research. Most manufacturers usually run an online support forum, so check it. Before you buy a laptop, if you are not sufficiently computer-savvy enough to avoid making a big mistake, you need to know what its most important hardware specifications are and understand what they mean. If you want to know what all of the hardware and software is that your existing desktop or laptop PC is using, the free Belarc Advisor provides that information. It also provides software-licence information, including the all-important Windows Product Key. 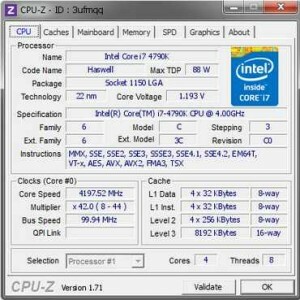 Other free utilities – CPU-Z (processor, memory, motherboard) and GPU-Z (graphics card) – also provide useful component information. You should always only download software from their official developers’ websites or reputable download sites, such as FileHippo, never from unknown third-party sites, because the downloads may contain dangerous malware/spyware. High-specification gaming laptops are available that are capable of playing the latest games designed for the PC instead of the gaming consoles – Xbox, PlayStation, etc. A high-spec gaming laptop is as capable as a desktop PC and, as such, is capable of doing the most demanding tasks, such as video editing. The specifications that are of the most importance are the processor (CPU), the hard disk (HDD) or SSD drive, the graphics card or graphics chip on the motherboard or processor, the amount of RAM memory and the sound card or integrated sound provided by a chip on the motherboard. Note that a gaming laptop will provide a cabled Gigabit Ethernet connection for the fastest online gaming, but a slow broadband connection cannot be made any faster by using a Gigabit Ethernet connection between the laptop and an ADSL or cable router,because that speed is only between the laptop and the router. A maximum broadband speed cannot be increased unless the cabling to your residence is upgraded from copper cables to, say, fibre-optic cabling. Every new laptop provides Gigabit Ethernet. I have a medium-priced laptop bought in 2007 that provides Gigabit Ethernet, so it is not new. For your information, a standard cabled 10/100 megabit Ethernet – Fast Ethernet – network connection is much faster than any ADSL broadband connection that is provided over a landline telephone line. The fastest connections are provided by a fibre-optic cable network, which are available in the most populated areas of most towns and cities in the UK. Even rural areas are now getting fibre-optic connections supplied by companies such as Gigaclear, which provides packages from 50mbps (megabits per second) to 1000mbps (1 gigabit per second (gbps)). My small village has just had its streets dug up to provide the cabling. The type of battery and how long a charge lasts is important. A laptop’s battery might have these specifications: 83Wh Lithium-Ion, 7500 mAh, 9 cells. Most laptops use Lithium-Ion batteries. Usually the more cells a battery has the better, but some 6-cell batteries are better than some 9-cell batteries, usually due to the higher mAh that the 6-cell battery has. The higher the mAh of a battery is, the better. The more important specification is the amount of charge, which is measured in Watt Hours (Wh). The higher the Wh, the better. The MSI laptop’s 9-cell Li-on battery provides 83Wh, which is very good. If you are going to use the battery for long periods, you must make sure that any laptop/netbook/tablet computer you buy provides long battery life. Mobile computers have batteries that are made up of cells – usually from 3 to 9 cells. Usually the more cells a battery has, the longer it will last when fully charged. However, a laptop with a 3-cell battery of the same type from a particular manufacturer will not last as long as a 6-cell battery of the same type from the same manufacturer, but a 3-cell battery from another manufacturer of the same type can last longer than a 6-cell battery of the same type made by other manufacturers, etc. Therefore, before you make a purchase, you must read the reviews of a particular laptop to find out which type of battery is provided and its expected running time, which depends on the kind of use it is being put through. Heavy PC gaming or playing a video uses more power than using office applications. Most brand-name laptop manufacturers that sell online, such as Dell, provide a choice of batteries of the same type (3-cell, 6-cell, 9-cell). However, if you buy a laptop from a retail store, the battery might not be customisable (you have to accept the battery it comes with). A battery’s mAh rating refers its storage capacity. A battery with a capacity rating of 2400 mAh should be able to deliver a current of 2400mA for one hour. Higher mAh ratings for the same battery type almost always means that the battery will provide power for longer. For example, a 6-cell 4800 mAh Dell Vostro 1510 laptop battery won’t last as long as a 9-cell 7200 mAh Dell Vostro 1510 laptop battery. You should only consider buying a laptop/netbook that has a Li-ion battery, which almost all current laptops have. Note that batteries that are described as OEM-compatible batteries are not original OEM Dell batteries made by Dell’s official battery manufacturers. Using the Dell Vostro 1510 laptop as an example, the batteries could be described by the seller’s website as “OEM battery for Dell Vostro 1510” plus this small print: “These Dell Vostro 1510 batteries are 100% OEM compatible with the original Dell Vostro 1510 battery”, which means that they are only OEM-compatible replacement batteries, not genuine Dell batteries. Replacement batteries can be every bit as good or even better than the OEM batteries and if they are good they are almost always much cheaper than the OEM batteries that they can replace. The Dell 9-cell li-ion battery for an Inspiron 1545 laptop was priced at £142.19 in March 2016, but the 12-cell li-ion replacement battery, which has three more cells than the Dell OEM battery, provided from the page linked to below is a quality product that was priced at only £36.82 in March 2016 (excluding a £10 delivery charge). Note the capacities on that page are 5200mAh for the 6-cell and 8800mAh for the 12-cell battery. I bought the 12-cell replacement battery for someone and it has a longer battery life than the 9-cell Dell battery that was damaged by the owner and had to be replaced. There are always rip-off vendors out there, so make sure that you search the web for any reputable negative comments about any vendor, while remembering that anyone, including a company’s competitors or just people being mischievous can post bad reviews. The best way to search for alternative suppliers is to find what the original Dell battery’s part number is from Dell’s website, which is 451-10587 for the Vostro 1510, and then use a search engine to search for it. A Dell battery has the words Dell printed on it. If you purchase an OEM battery there is a good chance that it won’t be able to charge using the Dell charger that is built into your Dell laptop because it’s part number identification won’t be recognised; you will probably have to buy an external battery charger capable of charging it, which is best bought from the same company that sells the OEM-compatible batteries. If you want to avoid any problems, buy OEM laptop batteries from the laptop manufacturer itself. They will almost always be significantly more expensive than non-official OEM-compatible batteries. You must visit Dell’s website to buy OEM batteries and you must only purchase a battery for your model of laptop. With any laptop manufacturer, a battery made for one particular model is unlikely to work with another model – even a model with the same name, say, Inspiron, but with a different model number. The following free utility helps you to prolong the life of your laptop’s battery and provides the current temperatures in degrees centigrade of the processor (CPU) and hard disk drive (HDD). It is accessed via its icon in the Notification Area of the screen (bottom left corner). Just holding the mouse pointer over the icon provides the temperatures. The number of USB 2.0/3.0 ports a laptop provides is important for devices that don’t connect via a cabled or wireless network, which is usually based around an ADSL or cable router. A laptop should have a minimum of 4 USB ports, which could be a mixture of USB 2.0/3.0. Windows 7 doesn’t include native (built-in) support for USB 3.0, but device manufacturers can provide USB 3.0 device drivers for their products. Windows 8.8.1/10 have native support for USB 3.0, which is 10 times faster than USB 2.0. However, most USB devices do not require a faster connection than USB 2.0. Only data-transfer devices, such as external hard-disk, SSD drives and flash drives can take advantage of the very much faster speed. USB 3.0 ports are backward-compatible with USB 2.0, which means that if you plug a USB-2.0-supported device into a USB 3.0 port, it should work at its native USB 2.0 speed. The image of an MSI laptop below shows 4 blue USB 3.0 / 3.1 ports. There are two on the other side, making a total of 6. The 4 round ports are the audio connections. USB 3.0ports can be added to a laptop by using an external ExpressCard adapter, which requires an ExpressCard slot that most laptops do not provide due to the USB standard having taken over most of the external connections used by laptops, such as Wi-Fi adapters, wireless keyboards and mice adapters, etc. It seems that for electronic reasons it is not possible to add USB 3.0/3.1/Type-C connectivity to a PC using a USB adapter dongle. It is easy to add USB 3.0/3.1/Type-C ports to a desktop PC by using a PCI Express (PCIe) adapter card. Type-C PCIe adapter cards are available – e.g. – ASUS USB 3.1 TYPE-C CARD that fits any PCIe x4, x8 or x16 slot. There is a new USB standard called USB Type-C that has a symmetrical connector that doesn’t have an up and a down side that previous USB standards have that can only be connected if the up side is up and won’t connect if the downside is up. 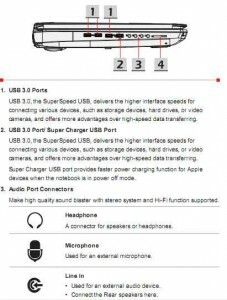 Moreover, previous USB standards have a cable with different ports that connect to the computer and to the device. You can connect a USB Type-C connector both ways and plug any end of the cable in the computer or USB device. The new standard is already being used on the MacBook, which provides only one USB port – a USB Type-C. The USB 3.0 standard runs at up to 5Gb/s (gigabits per second), 10 times faster than USB 2.0, but the newer USB 3.1 standard, which uses the same connectors, runs at up to 10Gb/s, so it might be worth considering a USB 3.1 cable for twice the USB 3.0 speed if your PC has 3.1 ports. 3.1 USB-A to USB-C cable adapters are available, making it possible to connect a USB 3.1 PC to a USB Type-C device. Visit the Processors: Intel and AMD CPUs section of this website for more detailed information on them. Most laptops use processors manufactured by Intel and AMD. Tablet PCs use processors made by Intel and AMD and other manufacturers. Intel is the largest manufacturer of laptop CPUs. Any quad-core CPU made be either of those manufacturers – a processor that is really four identical processors in a single housing that can work together as a single unit when using software designed to do so – will be fine for anyone using a laptop for office work, email and accessing the web, etc. But demanding uses, such as PC gaming, video-editing, etc., require the most capable hardware. To get an idea of the capability of a particular laptop CPU, it’s best to visit a benchmarking site like the one linked to below. A laptop that can play the latest PC games is powerful enough do pretty much anything else, so web-searching for gaming laptops, looking at the specifications and prices of the machines and reading their reviews will give you a good idea of what to buy. I would not buy a new laptop with anything less than a quad-core CPU, the performances of which can vary significantly from old to recent models, as you can see for yourself on the benchmarking site. To put those benchmarking results in perspective, the MSI M662 laptop that I am using to write this in March 2016 uses an Intel Mobile Core 2 Duo T5500 dual-core processor running at 1.66GHz dating back to 2007 that is a dual-boot Windows XP/Windows 10 system. It is given a very low benchmark rating of 920 that is way down the list provided by that CPU benchmarks site. The laptop is as quick as it ever was for office use and web-access. That said, the processor given the top benchmark rating is the quad-core Intel i7-5950HQ CPU running at 2.90GHz with a benchmark rating of 10,850 – more than 10 times higher than mine. If I had a laptop with that CPU, my office work could be done a bit quicker, but my ADSL broadband connection has a maximum speed of around 7mbps, so it would not be any quicker because my laptop’s CPU can handle that relatively slow speed very easily. Before you buy a laptop, look up its CPU benchmark on that site to give you an idea of its ranking compared to every other laptop CPU. Visit the Hard Disk and SSD Drives section of this website for more information on them. Note that some low-cost laptops, such as the Lenovo Yoga 300, don’t use a hard disk or SSD drive. That particular model of the Yoga range uses an embedded 32GB eMMC data-storage card, not an SSD drive. Both an embedded eMMC card and a SD card use flash memory that is much slower and of lower quality than the type of flash memory used in SSD storage drives. Bear in mind that the latest Apple iPhones use SSDs ranging in capacity from 32GB to 256GB. Hard disk drives have been in use for many decades, dating back to 1954. But the HDD took off and kept going after the first home PCs became available in the 1990s. Their capacities were measured in megabytes (MBs), which became gigabytes (GBs) and then terabytes (TBs). A byte is eight bits – the number of bits used to encode a single character of text. The drive manufacturers use the decimal measurements, which is 1000 kilobytes to a megabyte, 1000 megabytes in a gigabyte and 1000 gigabytes in a terabyte. But computer operating systems use the binary measurements – 1024 kilobytes to a megabyte, 1024 megabytes to a gigabyte, 1024 gigabytes to a terabyte. Therefore, the drive space measured by Windows will always be lower than the drive capacities as measured by the drive manufacturers. With SSD drives, which all use wholly electronic flash memory instead of magnetic disks to store data, the measurement of the drive space is measured in the same way as RAM memory, which is the same as how software developers measure HDD space – 1024 kilobytes to a megabyte, 1024 megabytes to a gigabyte – which is why the capacities are not rounded – e.g., 64GB, 128GB, 256GB, 512GB. If you see SSDs with rounded capacities of 120GB, 250GB, etc., that is the decimalised capacity that is used by HDD manufacturers. SSD drives are still very expensive compared to HDDs of equivalent capacities. I am still only using 100GB of a 500GB HDD on my laptop running a WinXP/Win10 dual-boot system. I have many text files, images, music files and videos stored on it. I am never going to use more than a quarter of that HDD. There are no bad manufacturers of HDD or SSD drives, so you need to make up your mind about how much drive space you need and whether to get a laptop with a large-capacity HDD or a relatively smaller-capacity but very much faster SSD. Read the Hard Disk and SSD Drives section of this site for more information on them and external HDDs and flash drives. Visit the Video/Graphics Cards section of this website for more detailed information on them. Most inexpensive laptops use an integrated graphics chip on the machine’s motherboard or provided by the processor. Both Intel and AMD have mobile processors that provide the graphics of laptops. Integrated graphics use system RAM memory, so reduce the amount of memory that the system can access. The more expensive laptops use discrete graphics cards that have their own RAM memory, which can sometimes be upgraded or replaced. Laptops designed for PC gaming always use a powerful discrete graphics card that uses its own memory. Integrated graphics solutions have improved considerably. You have to look through the specifications of a laptop to find out if a graphics card or integrated graphics chip is installed. Most laptop owners never change the graphics provision of their machines or its processor. Brand-name machines usually provide device-driver and UEFI/BIOS updates from their websites. For more detailed information on memory, visit the RAM Memory: DDR, DDR2, DDR3, DDR4 section of this website. All new brand-name desktops and laptops come with a 64-bit version of Windows. The more RAM memory the better for a 64-bit version of Windows 7/8.1/10, but not less than 4GB and preferably at least 8GB. A 32-bit version of Windows can only use a maximum of 3.2GB, so not more than 4GB should be installed. If extra memory is installed, it is best to use modules made by the same manufacturer of the same speed. The SODIMM memory modules used by laptops are smaller and thinner than the DIMM memory modules used by desktop PCs. Visit the RAM Memory section of this site for more information on it. Visit the Sound Cards and PC Sound Production section of this website for more detailed information on PC sound. Laptops are designed to be mobile devices with as few attachment ports as possible, so the sound is delivered via built-in speakers by a sound chip on the laptop’s motherboard or can be provided via an external USB sound card or USB dongle to which speakers can be added. It is also possible to attach a sound device, such as an X-mini capsule speaker system (also available in wireless Bluetooth) to the lime-green analog audio Line Out port that can also connect a set of front speakers. Wireless Bluetooth speakers are also available. Many laptops provide a digital S/PDIF sound connection tha enables the connection of an amplifier. The MSI GT72S-6QE gaming laptop provides excellent onboard sound. 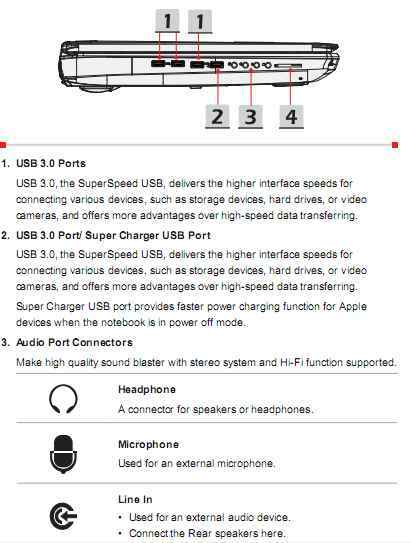 The following three images show the four round audio ports themselves and the extracts from the MSI user manual for that model explain what they do. The Headphone Out port can also be used as a digital S/PDIF-Out port to connect an amplifier. The Nahimic Virtual Sound Surround has an app for configuring audio settings. Click on the images to view their full size. The following webpage provides a table that shows the full specifications of several expensive laptops that is a useful guide on what specifications to look for in any laptop. The type of battery and how long a charge lasts is important. For the MSI laptop it is: 83Wh Lithium-Ion, 7500 mAh, 9 cells. Most laptops use Lithium-Ion batteries. Usually the more cells a battery has the better, but some 6-cell batteries are better than some 9-cell batteries, usually due to the higher mAh that the 6-cell battery has. The higher the mAh of a battery is, the better. The more important specification is the amount of charge, which is measured in Watt Hours (Wh). The higher the Wh, the better. The MSI laptop’s 9-cell Li-on battery provides 83Wh, which is very good. Note that most laptops have an integrated GPU (Graphics Processing Unit) and a dedicated graphics card, which makes it possible to use add another monitor or use a manual switch to switch between them for lower power use. The integrated graphics uses less power. The MSI GT72S 6QE dedicated graphics is described as Nvidia GeForce GTX 970M 3GB, which has 3GB of its own memory. Integrated graphics (Intel HD 4600) uses variable amounts of system memory, which is set in the UEFI BIOS. All of the laptops in the table provided by that website’s page have one or two SSD drives and all but one of them provide a 1TB Hitachi Travelstar hard disk drive as secondary storage. Most inexpensive laptops only provide a HDD or an SSD. All of the laptops use an Intel i7 quad-core processor. The MSI laptop uses an Intel® Core™ i7-4710HQ Processor. The 4/8 means that there are four real cores in the processor, but the Hyper-Threading technology that it supports creates four extra virtual cores, making 8.